I am not sure if it happened to you, but the moment the placenta left my body, so did my confidence. I am not entirely sure where the hell it went, or what exactly happened, but everything shifted. I began to question myself, I had gained weight, I plagued myself with guilt and self hate. It was a slow downhill spiral, that I almost didn’t realize was happening. I steadied off a bit while I joined a stroller fitness class and lost the baby weight, but then my mental well being shifted again when we moved from Vancouver to Montreal. For a year I was able to work on myself mentally and physically, as we built a business from home and concentrated on our family. We moved after a year from Montreal to Toronto. I was able to shift easily, for a year things were O.K. then the downhill spiral began. My son started school, and I found myself torn between our business, my son’s school adjustment, sports, and social life. I tried to organize Mom nights out, and had it stuck in my head that this was going to be my social life. Little did I know, that my confidence had left me, my anxieties began to intensify, and my PTSD began to plague me again. When I became a mother, I didn’t notice my natural desire to show my child the world of architecture, art, history and culture until it became glaringly apparent when he began school. I was the Mum who found myself taking my child out of school to travel, to take trips to museums and art galleries, we hiked on weekends, we were outdoorsy. I attempted to immerse myself around other Mother’s, trying hard to fit in, feigning interest as they spoke about clothes, decorating and Florida (no offense to Florida or decorating, if fact, I love all the Mums I have met, they are all lovely), I began to lose myself, trying to figure out what I was supposed to do. I can remember vaguely, looking in the mirror and hating what and who I had become. I stopped sleeping again, I would sit up watching a movie, eating M&M’s, crying silently, unable to figure out how to get out of the cycle. I started an anonymous Instagram account, and found myself following a bunch of ladies who followed the Bikini Body Guide, I had no idea what it was, nor did I know who Kayla Itsines was. Night after sleepless night, I looked up the accounts. It would take me a lot of M&M’s, but I finally found myself after a breakdown, taking my credit card and buying the BBG program online. I slowly started the program, going to the gym again, making it a routine. It wasn’t easy, I cried a lot, bucket loads in fact, plus, I still ate a lot of M&M’s…I was moving my body, but you can’t outrun your mouth, and I was eating a ridiculous amount. 2 Years ago, I woke up and told myself to stop, it was like a light switch went off. I stopped trying to be anyone else. 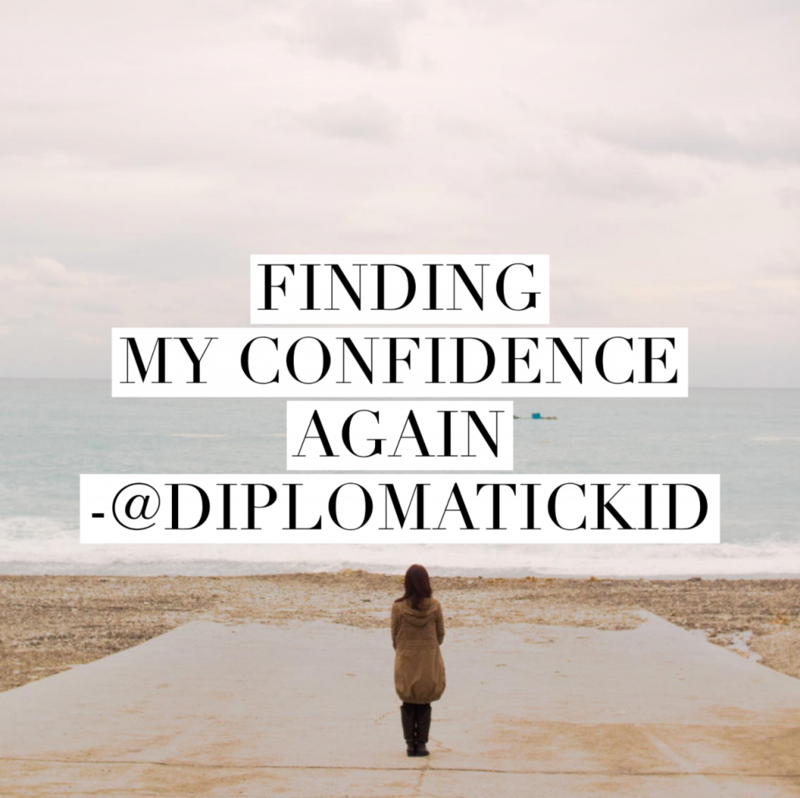 I went back to writing about my diplomatic life. Started to reach out to my international community, and started to meditate. It clicked. I clicked. My confidence clicked in again. I found a sense of peace I hadn’t had in a long time. I kept up with BBG, and stopped eating M&M’s. I started sleeping again, not just light sleeps, but deep sleeps. I stopped drinking alcohol and my eating started getting cleaner. For so long, I felt like I had been swimming in jello, and all of a sudden, I was running on clouds, feeling light and free, and amazing. It wasn’t the BBG program that changed me, it was the positivity that I found on that online community. It was that feeling I could reach out and find people who were like me, but lived elsewhere. My confidence slowly shifted to just owning it, no matter what my weight or muscle mass is, I can just own it. If only this community had existed when my confidence disappeared with my placenta, I wouldn’t have needed this crazy journey! Whatever your journey is, wherever you live, find your tribe and workout with them!